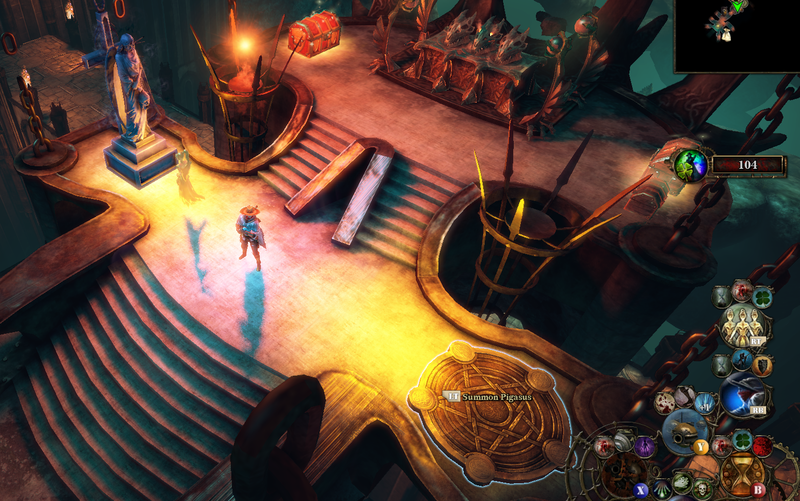 The Incredible Adventures of Van Helsing is a Diablo clone action RPG based on Van Helsing lore. There are three episodic releases from 2013 to 2015, and at the end of 2015 they released a combined Final Cut release containing all three. If you have the first three episodic releases, you can get a free Final Cut release from their website. It's important to note I played the Final Cut release as the Bounty Hunter, so certain screens and features may be different in the individual episodes. The graphics are on par with what you get from the Diablo or Torchlight games. There is plenty of variety, but detail doesn't really matter since you're never zoomed in enough to see. Music and audio is also on par and pairs well with the Van Helsing lore. The voice acting is great, with enjoyable accents and banter. Even the poor voice actors are quite entertaining in their own way. 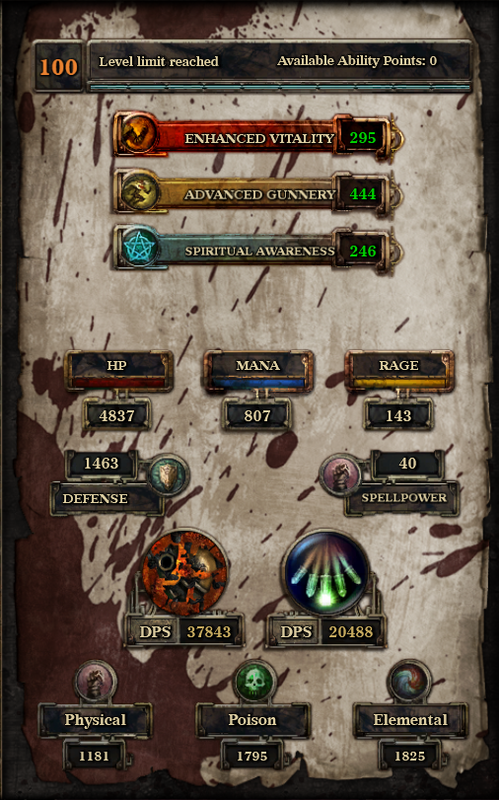 Exactly what you expect with a Diablo clone, choose your class, go hack 'n slash, loot, upgrade equipment, level up, enhance, repeat. The upgrade system is overwhelming at first, but quite good, giving you a range of skills you can focus on, and the ability to reset points if you don't like it. You also get the added bonus of your companion, Lady Katarina, who you also get to apply points to, unlock skills, things that even carry over and benefit Van Helsing. Now onto some of the more detailed things you can accomplish near or after the end game. I found there was very little information out there on how these things actually work, especially in the Final Cut. Maybe the developer added some features last minute to wrap things up, but the fan base had already dwindled down. I'm really not sure. Green gear sets - if you're lucky you can get a drop during gameplay of the story, I didn't but one friend did get one. Otherwise, you are purchasing them from the hidden vendor called Pigasus in adventure mode secret liar. 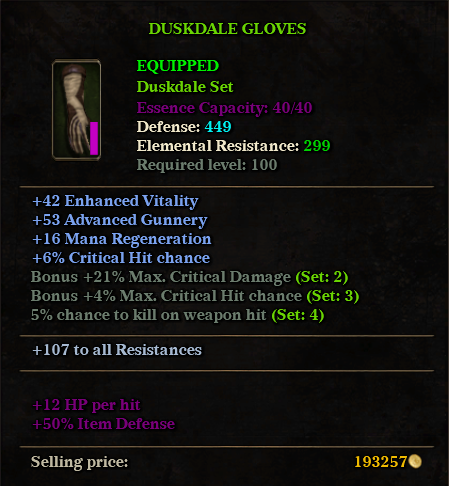 At 6 million gold per pop, it's expensive to get a full set. This hidden vendor needs 5 essences to open up, find him on the right side up at the trophy desk alter in your adventure mode secret liar. When you summon Pigasus with useless essences, around 4 pieces of gear are randomly available. Rinse and repeat is required to try to buy what you want. Godlike gear - But does green gear even matter when there is god-like purple gear? 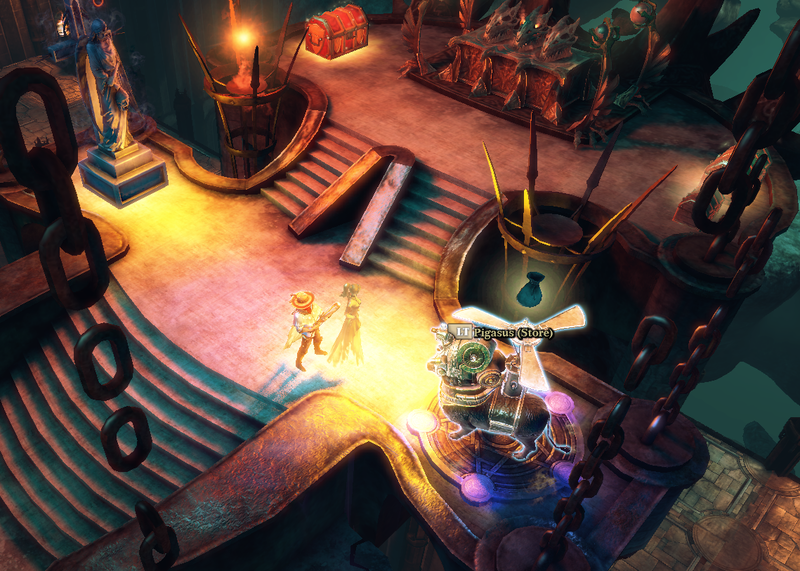 There are only 6 Godlike items in the game, and you have a chance of getting them from the gold chest located up by the trophy alter in your secret liar in adventure mode. In order to open the chest you need to buy a key from the Mistress of Keys. Keys costs fate points, which you earn in adventure mode. There are bronze, silver and gold keys. Don't bother with the bronze or silver, you can only get precious Godlike gear from the gold chest using a gold key. Each gold key cost 1000 fate points and I've read you have a 2% drop chance for a Godlike item. I had racked up 2300 fate points by the time I achieved level 100 on my character, so I had two chances. I attempted to buy a key from the Mistress of Keys, and it wasn't working. After fudging around for quite some time I determined the menu created for controller support is borked. You need to switch to keyboard and mouse mode (requires game restart) in order to get a different menu that actually works to purchase keys. So I started buying my keys. First gold chest was a bust, but did drop a ton of essences, a green item, and other crap gear. During my second shot eating up another 1000 fate points I got lucky and got the purple Godlike amulet (Torq of Perfection)! 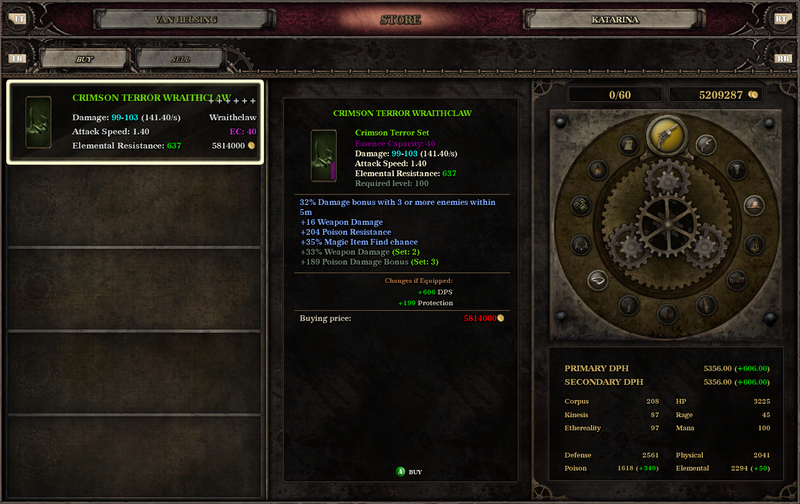 Godlike items can be upgraded at Todor Schimko (the Meta Forge) in your secret liar using fate points and gold. 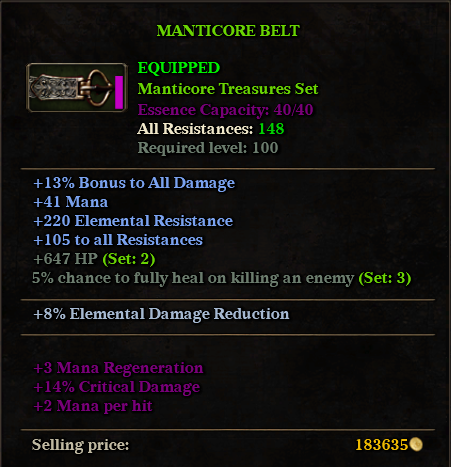 This actually wan't all that expensive relatively, and I got my amulet upgraded to 10/10, which unlocked the steam achievement "Upgrade a Godlike item to its full potential". Each Godlike level upgrade unlocks another bonus stat. 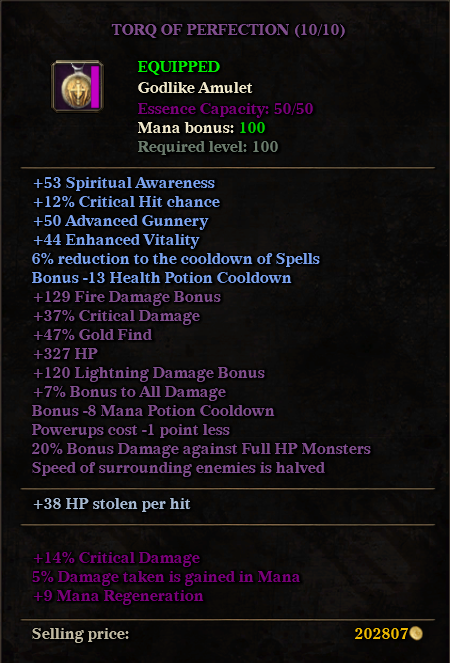 This really sets a Godlike item apart from all others cause not only do you have an enchantment, and 50 essence capacity, you have 10 additional bonus stats. And, no need for complete sets to get bonus stats like with green gear. I didn't play much after obtaining my two green items and my Godlike amulet, but from what I did play, it makes a huge difference. My stats shot up to 20,488 DPS for my exploding scattershot skill (ranged attack gun shot), and 37,843 DPS for my destroy seekermatons skill (basically drone orbs as bombs). The other cool thing about having a Godlike item is I was now sporting a purple aura all the time. 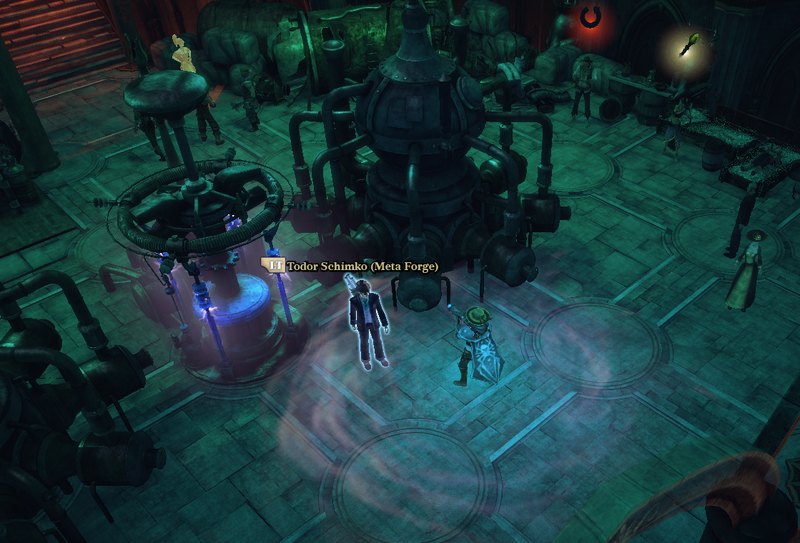 The Van Helsing lore is by no means original, but does make for a good hack 'n slash Diablo clone. The game is spot on to classify it as a true Diablo clone, so originality doesn't matter a whole lot if you are starving for this type of game. There is actually quite a bit of replay value in this game. With the three episodes combined into the Final Cut, there is plenty of story to play. There are also several classes you can choose from, and reply the story as each. You also have cooperative play with friends, which is what I did online with three other friends. The adventure mode at the end also allows you to grind and work on maxing out your stats and drool over you Godlike gear that's hard to obtain. The grinding is a chore, especially from level 90 to 100, but there are definitely people who love that sort of thing, and will get countless hours of gameplay as a result. If you love Diablo-like games, this game is a must play. It ranks #3 for me behind Diablo and Torchlight.